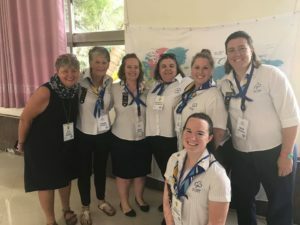 In December 2018 a contingent of six Australians set off to Entebbe, Uganda to attend a Girl Guiding World Centre event at Kusafiri. This Kusafiri event involved two programs, one, a cultural program providing participants with the opportunity to experience Ugandan art, people, crafts and traditions. The other, a training event for facilitators of a Girl Guide youth event, the Juliette Low Seminar to be held this year in November. Rosie Waite is a Girl Guide Leader from Tasmania and she attended the facilitator training. 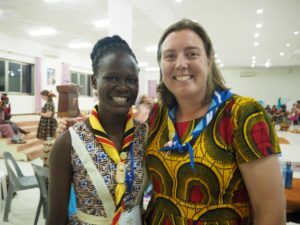 Here she tells us what it was like to head off to Uganda for a worldwide Guiding event. So, if I mention Girl Guides, I’ll bet your first thoughts are sewing on buttons, making cups of tea and those infamous biscuits and whilst I indulge in all those things from time to time, Guiding is so much more. I began my Guiding journey as young person in Shepparton, Victoria, but it wasn’t until I was at university in Sydney when I became a Guide Leader. Since then I’ve been toting my Guiding along with me, through placements at university, and jobs across the north of Tasmania. At every stop I’ve had a ready made social interactive portal, a place where I can make a difference in my local community, but it’s also a place where I’ve grown in confidence and ability. I’ve had many opportunities in Guiding; from serving on state and national committees for the promotion of the outdoors to running activities for children in a slum school in India. And just recently, I’ve had the opportunity to go to Uganda. Now if, like me, your knowledge of African geography is a little hazy, Uganda is right on the equator, on the eastern side, sandwiched between Southern Sudan, Democratic Republic of Congo, Kenya, Tanzania and Rwanda. It’s the current location of the moving African world centre for Girl Guiding, Kusafiri. 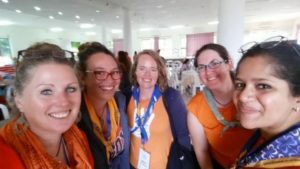 Globally, Girl Guides runs a leadership event every two years for young women across the organisation called the Juliette Low Seminar. There’s a push on to extend the reach of this program, so instead of running in one place next year, they’re going to run it in twenty places across the world. Hence the need to recruit and train more facilitators, and I was lucky to be selected, among three other Australians, to join a larger team of 80 Guides from 42 countries. Naturally, participants in the training connected via Facebook prior to the event and there was a flurry of planning for side trips to various places. 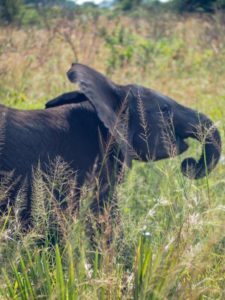 I took the opportunity to connect with five others and took a three-day safari in Murchison Falls National Park. Although two of those on safari were Australian, I’d never met them before. We had a marvellous time, such that our tour operator thought we were firm long-term friends and in fact we were, we were sisters in Guiding. We saw warthogs, giraffe, elephant, buffalo, hippopotamus, crocodiles and lions, laughed and joked and shared experiences from our various countries and expectations for the coming event. Just like any other training course, there were post-it notes and flip charts, but unlike any other course we all had so much in common already. We were all members of the same organisation, we’d all made a promise to serve our countries and develop our beliefs and we’d all experienced team work in a version we like to call the patrol system. And then again there were so, so many differences across culture, language and age. We explored the world Guiding organisations new leadership development model with a particular focus on how barriers to gender equity were experienced across the globe. It was inspirational to be part of those conversations, hear what everyday life is like in Uganda and compare that to Austria, Hong Kong and Costa Rica, all on the same table. Part of our experience was to visit a local social innovation enterprise and look at leadership in action in Uganda. We visited SINA, Social Innovation Academy, outside of Kampala. There, disadvantaged Ugandan youth are appointed as scholars and undergo a series of steps under the supervision of a mentor. They come up with a project and execute it. As Pascal, a mentor in the program said, they are creating job creators, rather than job seekers. 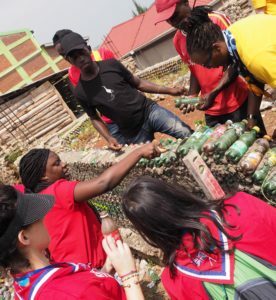 In effect, changing the lives and opportunities of Ugandan youth to embrace not only entrepreneurship, but also environmental activism, social change and empowerment. We spoke with scholars of varying projects from a scheme to provide reusable menstrual pads to country areas, to making fashion raincoats from sugar sacks that have graced catwalks in New York, to engineering a construction method using up-cycled bottles. These scholars spoke of their projects with an inner pride that brimmed out with their enthusiasm for their respective projects. I was struck by the magnitude of social change this organisation could affect and the way their scholars were inspired. Having amassed these awesome connections and experiences, we were then divided in to our twenty hub teams. I was assigned to the hub in the United States of America with three others. We are from Lebanon, Ireland, the United States and Australia and we are the international component of a facilitator team with a year to prepare. A year of liaising across oceans to deliver a coordinated program of leadership development for 50 young women from across the Guiding world, and to inspire them in their leadership journey onwards in life. Looking back on my experience in Uganda, I remember a moment that crystallised so much. We were at SINA, in a building made from plastic water bottles compacted with earth, there’s a deaf Ugandan woman sewing a shoulder bag made from cement sacking and colourful African fabrics. She’s part of an upskilling program for people with disabilities run by a SINA scholar. She’s doing an amazing job and I want to tell her and whilst I’m asking the scholar to thank her for us, one of our group, Samantha from Canada has started signing to her. It was magical, seeing that connection, across cultures, across language, across so many divides, and yet despite the barriers, that linkage occurred. It reminds me that we are all fundamentally human, looking for social connection, meaning and understanding, and despite so many obstacles, it’s possible and the impact that can be made can be wider and have more knock-on effects than we will ever know. And you know what, this amazing global organisation has opportunities coming up every day. Opportunities to get involved at home, in the service or facilitator team for the Australian JLS hub in Sydney, opportunities to attend the JLS as a participant in one of the twenty hubs, opportunities to volunteer at World Centres and opportunities to camp or jamboree in many, many countries. Where will your Guiding adventure take you?